Plans for a revamped pedestrian walkway over Wilson Boulevard in Ballston are up for discussion tonight. Arlington County is scheduled to host a community meeting on the redesign of the pedestrian bridge at Ballston Common Mall (4328 Wilson Blvd) from 6:30 to 8 p.m. The gathering is slated to happen in the mall’s second floor retail area across from the Payless shoe store. Attendees will have the opportunity to meet the walkway’s designer and give feedback on the project. A new bridge is part of a $317 million plan to redevelop the mall, which is being rebranded as Ballston Quarter. 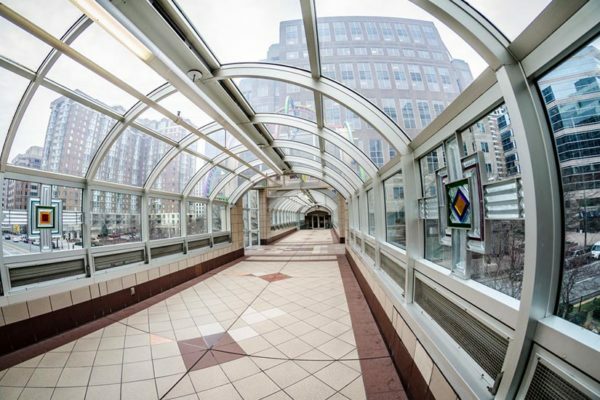 The walkway provides an elevated, indoor pathway to the Ballston Metro station. Final plans for bridge are expected to go to the county manager for consideration in late June.